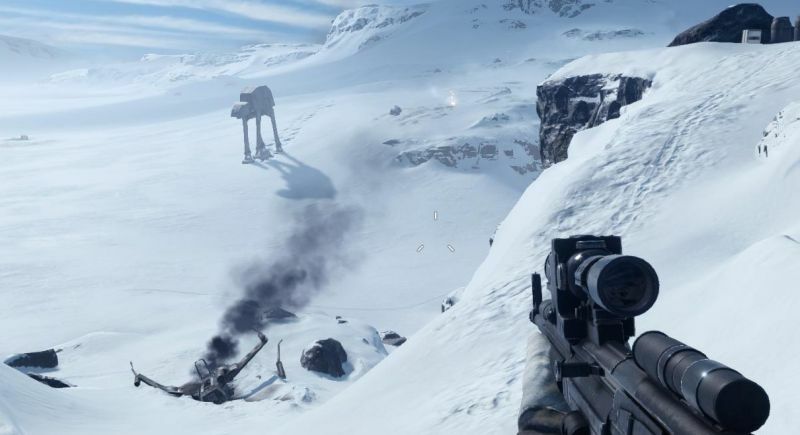 In this article you will learn how to limit the frame rate in Star Wars Battlefront. You could already limit the FPS in Electronic Arts games like Battlefield 4 or Battlefield Hardline and other previous titles. I won’t go into detail why you might want to limit the FPS in Star Wars Battlefront as well, I mentioned the reasons for FPS limitation already in the articles of the games I linked, check them out if you want to know more. In this article you will learn how to enable the FPS limit in Star Wars Battlefront, let’s take a look. To limit the FPS, we first need to open the console with the tilde key (~). Use the command “gametime.maxvariablefps 61” without quotation marks and replace the number with a float value you want to use as FPS limit, and confirm the command with the return key. In my example the FPS would then be successfully limited and wouldn’t go above 61 frames per second. Learn how to create a Battlefront config file and create your own. There is an example screenshot in my article that shows how you need to write the command into the file. Copy the command “gametime.maxvariablefps 61” without quotation mark into the file and save it correctly as mentioned in my configuration file tutorial. To disable the FPS limit, you just have to remove the line from the configuration file. As said, if you want to read more about FPS limitations, check out my Battlefield 4 FPS limit article, and also check out the comments there where a lot of questions have been answered. I hope my article helped you to understand how to limit the FPS in Star Wars Battlefront. Feel free to drop a comment, and if you have time, help me too and share the article. Have fun! Happy gaming! But I’m curious why not just enable vertical sync under settings, it will give you the same fps as the monitors refresh rate? 60 fps for a 60 Hz screen. That sounds fair, I have always been a fan of vsync to keep a locked fps. Yep, just try, if you don’t feel a difference, use what always worked for you… I think the reason why there are so many different opinions about stuff like that, is that there are so many different system setups used… something can work well for someone, but not so well for another person, and the other way around. But anyway, FPS limit should work very well if you found the perfect limit for your system and screen… try values like 60, 61 or even float values like 59.94 FPS (the last one if your screen has no real 60Hz but something like 59.94Hz)…. I know from my BF4 article about the same subject that people had luck with different values, it’s a little bit of trying but works pretty well in most cases when you found your perfect cap somewhere near 60 FPS 🙂 Happy gaming!